Pistachio Hair Studio originated with the value of education and being able to provide a training ground where aspiring hair designers can evolve and further their careers both artistically and professionally. Understanding that education is at the core of our salon, we developed a more comprehensive in-salon educational program targeted at all stylists, regardless of their experience level. We believe it is essential that all stylists on Pistachio’s team pursue continuous education in the most advanced techniques and cutting edge styles. The Pistachio advanced education program is a Eufora-based cutting system. 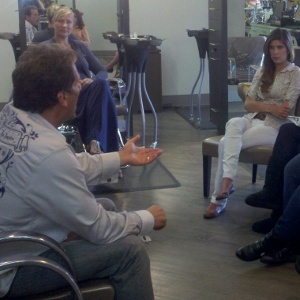 Educators of Eufora and Davines lead our classes in advanced color theory and application. It is imperative that our stylists receive incessant education and coaching from experts with years of experience in the beauty industry. One of the many brilliant designers that have worked with Pistachio’s education program is Robear Landeros. Robear is a world renowned educator for Davines and has worked with numerous celebrity clients, including Jennifer Aniston, Salma Hayek and Christina Aguilera. In his teachings, he utilized many different techniques designed to represent progression from the awards party to the after party. These styles were seen in Runway This Season! Robear Landeros is just one of many experts who have participated in Pistachio’s pursuit of continuous education that ensures our clients will leave feeling and looking fantastic.